When I asked on Facebook a while back if anyone wanted to share healthy (and easy!) slow cooker “Clean Cuisine” recipes one of my high school friends, Ruth Henry (last name is now Keyes), generously sent me one of her family’s favorites, a slow cooker turkey chili recipe. 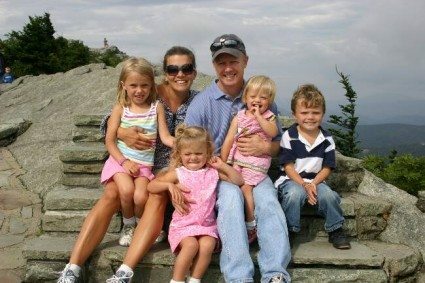 Ruth was a cheerleader with me back in the day and she is now the mother of four absolutely adorable children (see the photo below). As a busy mom I’m guessing Ruth must use her slow cooker a lot! One thing is for sure, slow cooker recipes are ideal when cooking for a crowd. With very little hands-on-time you can create delectable, nourishing, and wholesome dinners—something I am sure most moms would love to make for their families. One of the biggest misconceptions about the slow cooker is that you can throw all of the ingredients into the pot, leave the house for the day and return to a perfectly home cooked meal. Not quite. The slow cooker is a wondrous appliance, but it is not a magical miracle worker. The slow cooker saves tremendous time because it allows you to “fix it and forget it”, but you do have to prepare the food properly first. You should also make sure to add your herbs and spices to the vegetables and meat and cook them on the stovetop for just a few minutes before transferring to the slow cooker stoneware. This will help the maximize the flavors. Oh! And make sure you don’t add too much liquid to your slow cooker recipe. This is because slow cooking generates a lot of liquid since the lid is covered and moisture can’t escape. So, just resist the urge to add a lot of liquid if the recipe seems a bit dry at first because otherwise you could end up with a soggy mess. And of course, don’t overcook. Nothing tastes worse than overcooked food from a slow cooker. 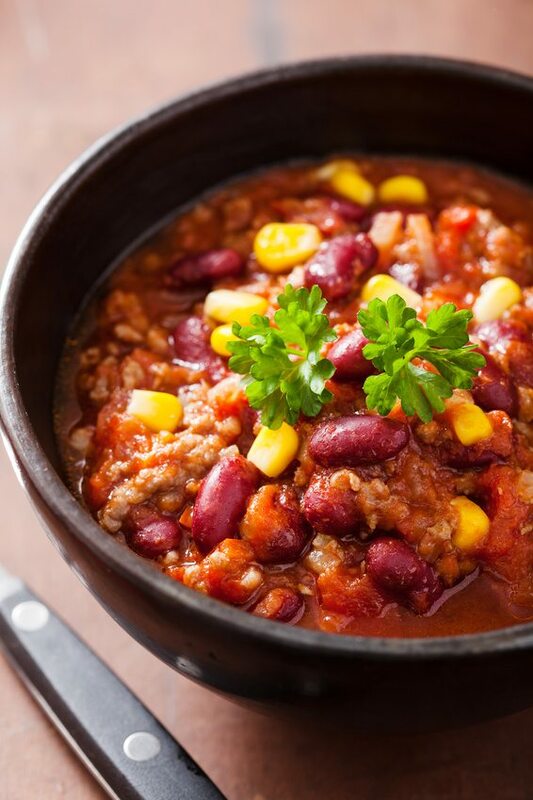 Even though my friend Ruth’s slow cooker turkey chili recipe was already very healthy I couldn’t resist adding superfood tempeh for added nutritional oomph. Originally from Indonesia, tempeh (pronounced TEM-peh) is a fermented and highly nutritious “whole” soy food. It has a deliciously mild mushroom-y nutty flavor and chunky, chewy texture. Tempeh is a rich vegan source of protein and also an excellent source of omega-3 and omega-6 fats. On top of that, it’s jam packed with fiber and loaded with disease-fighting phytonutrients, vitamins and minerals. You can find tempeh sold in a cake-like patty in the refrigerated section of your supermarket or natural foods store. It is almost always located right alongside the tofu. Although tempeh is super versatile and can be marinated, seasoned and grilled, pan-fried or grated into soups and salads, for this recipe you’ll simply want to crumble it and mix it right in with the ground turkey. Tempeh is actually perfect for mixing with (and hiding out in) any ground meat. NOTE: For best results, when cooking with tempeh and mixing it with ground meat you’ll want to sauté the tempeh in a little bit of extra virgin olive oil along with some crushed garlic and chopped onions. Once the onions are tender you can then add your ground meat. What to Top Your Chili With? Clean Cuisine “Sour Cream” (made with nuts!) is the perfect chili topper! Click HERE for the dairy-free sour cream recipe. Heat the oil in a large heavy skillet (preferably cast-iron) over medium- heat; add the garlic and sauté 30 seconds. Add the onions and sauté 4 to 5 minutes, or until soft. Add the crumbled tempeh and sauté an additional minute. Stir in the ground turkey, season with salt and cook 3-4 minutes, or until meat is no longer pink. Add the diced celery, carrots, and bell pepper. Season with additional salt. Sauté 4-5 minutes, or until vegetables are soft. Add the chili powder, cumin and coriander. Cook for 2 minutes. Transfer the turkey-vegetable mixture to a 5 or 6 quart slow cooker. Mix in the tomatoes, beans, parsley, lime juice and salsa verde. Cover and cook on low heat for 3 hours. Add the corn for the last 10 minutes of cooking. Stir everything together before serving. Serve warm. P.S. If you like the Slow Cooker Turkey Chili Recipe be sure to check out the recipe for Slow Cooker Bolognese! 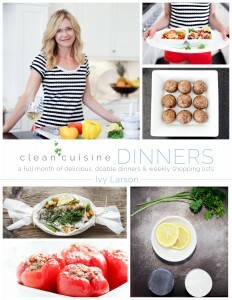 Hungry For More Clean Cuisine Dinner Recipes? Beginning Raw Food Recipes? Try the 10 Minute Vegan Burger! u really understand everything that u are writing about! This is certainly the 4th posting, of urs I browsed. Just wondering what you served with the Chili. Thank you!